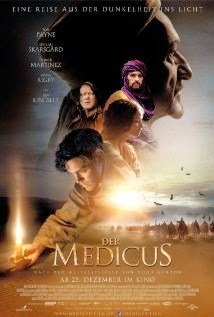 Movie Review: Set in 11th Century, “The Physician”, is a German film in English-language based on Noah Gordon’s novel with the same name. However, the adaptation made by Jan Berger didn’t make justice to the book, a hit in Europe, leaving this epic adventure a few miles away from the original story. It starts in England, where the smart young orphan Rob Cole becomes apprentice of an uproarious barber surgeon who applies primitive and painful methods for treatment. When the latter almost gets blind due to cataracts, he agrees to be operated by Jews who brought sophisticated techniques from Isfahan. With an enormous will for learning more, Cole will disguise himself of Jew (since no Catholics are allowed) and travel to Persia to study with the great Ibn Sina, the biggest reference in medicine. Guided by his God and a sixth sense, nothing hampers Cole towards his triumphant discovers. The scenarios and settings reflect well the conditions lived in each place – England was depicted with fog, somber, and misery, while in Persia we can see sunlight, abundance and knowledge. Indeed, the plot showed not to be in the same level as some of its technical aspects such as production and costume design. Helmer Philipp Stolzl created an atmosphere taken from “Prince of Persia”, “Alladin” and “Sinbad”, but the course of the story becomes uneven and the film struggles in its middle part to maintain the vivacity of the first half-hour. Slightly entertaining but highly clichéd, “The Physician” might please inattentive fans of adventure genre, but wasn’t solid enough to be recommended without considerable reservations.